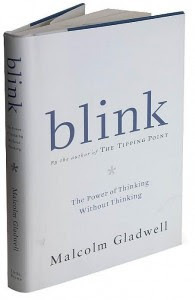 Blink is Malcolm Gladwell's second book, but the first that I've read. As a book for popular audiences, it provides an enjoyable look into the psychology of intuitive judgments. Using examples ranging from experts intuitions about a 'fake' 6th century BC Kouros statue, to judgments about the suitability of dating partners, to snap judgments we make about political candidates, to procedural safeguards that are in place to guard against police 'abuse' during heated, and adrenaline producing, moments. The take away message being that under the right circumstances, humans are pretty good intuitive judges, even if we can't exactly 'nail down' the reasoning behind our judgments until much later. Indeed, this intuitive cognitive system (sometimes referred to as automatic processing) appears to have evolved as a mechanism that enabled us to make rapid judgments about stimuli that could have life or death consequences. However, from time to time this intuitive system sometimes leads to errors, and, on occasion, those errors can be fatal and tragic. The key to all of this is that one needs to learn when to trust his or her intuitions, and when not to trust them. For each example that Gladwell discusses, he discusses a somewhat disappointingly small amount of the vast scientific evidence that is pertinent to each of his main topics (and this body of literature is large). The main shortcoming I found in this book is that I would have liked to hear about more scientific research that could move his examples from the realm of simple anecdote to a generalizable phenomenon that all people tend to rely on. Overall, this book presents an enjoyable entry into some of the issues dealt with by Judgment and Decision Making psychology or Behavioral Economics. However, I think there are a number of extremely well written (and recent) books in this area for popular audiences (some suggestions below) that focus more on the actual research and provide a greater breadth of important ideas than Blink does. While Blink is a wonderful introduction, I think it only scratches the surface of a field of research that offers a great deal of insight into human cognition and behavior.